Folks in Orlando, Fla., worry more about finances than any other big city, while Washington, D.C. residents worry the least. Folks in Orlando, Fla., worry more about finances than any other big city, while Washington, D.C. residents worry the least. That is among the findings of a national Consumer Distress Index compiled by CredAbility, an Atlanta-based consumer help agency. CredAbility assesses consumers’ financial worries through a 100-point index that includes measures of employment, housing, credit, household budgeting and net worth. A score below 70 is considered distressed. 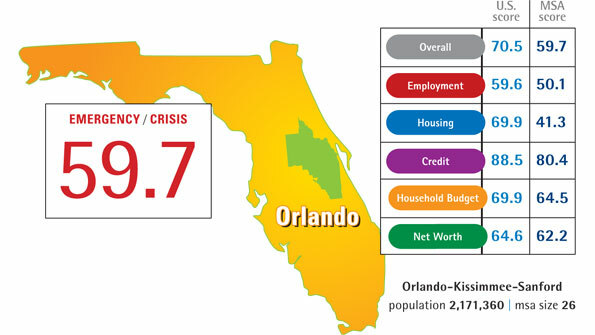 Orlando ranks as the most financially stressed metro area. Its score of 59.7 earns the city an “Emergency/Crisis” rating. Washington, D.C., the least stressed metro area, clocks in at 76.8, which still only garners a “Weakening/At-risk” rating. That shaky-at-best feeling is consistent throughout the distress ratings. The national score is a barely stable 70.5 for the third quarter, down from 71.3 in the second quarter. CredAbility cited as causes for the lower rating a rise in mortgage delinquency and an uptick in people working part-time who would rather be working full-time. Still, in the glass-is-half-full category, folks seem to be worrying less than before. The current national score is almost four points higher than the third quarter a year ago.